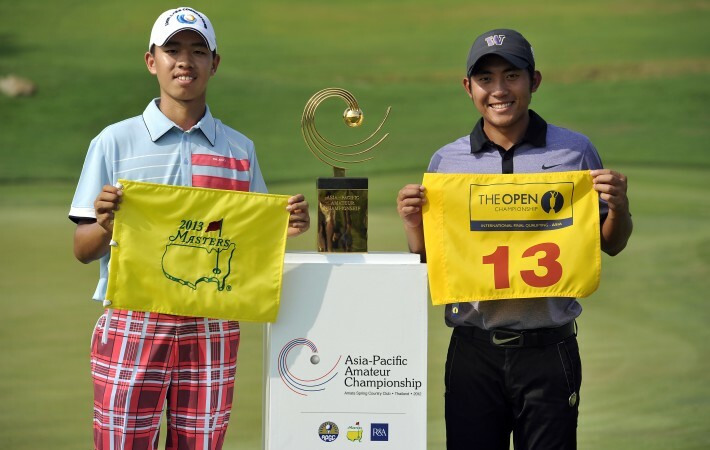 Chinese prodigy Guan Tianlang, 14, became the youngest winner of the Asia-Pacific Amateur Championship after a closing one-under-par 71 gave him a 15-under total of 273 and a nail-biting one-stroke victory at Amata Spring Country Club in Chonburi, Thailand. Guan, the youngest player in the field, completed a wire-to-wire victory that has earned him an invitation to next year’s Masters Tournament. He has also secured a place in International Final Qualifying (IFQ) for The Open Championship along with runner-up Pan Cheng-tsung of Chinese Taipei, Asia’s No. 2 amateur, who shot a 65. Australian teenager Oliver Goss (72) finished third at 12-under, two ahead of two-time champion Hideki Matsuyama (68), Asia’s No. 1 amateur. When the Masters begins next April, Guan is set to become the youngest competitor in the history of the Tournament at 14 years, five months and 17 days. The previous record was established by Matteo Manassero in 2010, when the 16-year-old earned an invitation after winning the British Amateur Championship in 2009. “I’m so excited. I’m really happy to become the youngest player at the Masters and looking forward to going there. I don’t know what’s going to happen there, but I know I just want to do well,” said Guan, who punched the air in delight after holing his five-foot par putt on 18 and was quickly embraced by his proud father. “Pan really did a good job, so I just needed to focus on my game and get some more birdies and keep going. I knew Pan had a really good front nine, so I was checking the scores a bit on the back nine. I just thought if I got a couple more birdies I would be the champion,” added the Guangzhou-based schoolboy, the event’s first Chinese champion. After posting earlier rounds of 66, 64 and 72, Guan started the final day two ahead of Goss. Guan, who weighs just 56 kilogrammes (125 pounds), opened up a five-shot lead with birdies at holes two and four, where Goss fell away with a double bogey. ‘Langlang’ dropped back with bogeys at seven and nine, but birdies at 11 and 14 kept him two clear of a charging Pan, who peppered the scoreboard with nine birdies. Guan’s lead was cut to just one after a bogey on 16. Guan, who spends three months in Florida each summer, showed impressive composure to par the 141-yard, island-green 17th and the par-four 18th, where his 60-degree wedge shot from just off the green rolled five foot past the flag. After inspecting the putt from several angles and wiping his face and hands, the laid-back teenager stepped up to hole the most important putt of his short career. “I had a great up and down on the last hole. I was a little bit nervous over the putt,” said Guan, who averaged 250 yards with his driver. Pan put pressure on Guan with a sensational round. The Chinese Taipei star birdied the first, had a hat-trick of birdies from four to six and bogeyed nine. He started the back nine with four straight birdies, before his charge was again halted by a bogey on 14, but he responded with another birdie at 15 before coming home with three straight pars. Goss, a quarter-finalist at this year’s US Amateur, also enjoyed a fine tournament. The Perth-based teenager recently won the Western Australia Open to add to his Western Australia State Amateur victory in March. However, it will be Guan who now looks forward to following in the footsteps of 2010 and 2011 champion Matsuyama, who in April made the cut in the Masters Tournament at Augusta National Golf Club for the second straight year. Guan, who plays at Lion Lake Golf Club in Guangzhou, is used to breaking records and making history. He was the youngest winner of the China Amateur Open last November, while his appearance in this year’s China Open made him the youngest player to compete on the European Tour. Organised by the Asia Pacific Golf Confederation (APGC), the Masters Tournament and The R&A, the Asia-Pacific Amateur Championship is the world’s most televised amateur golf tournament, aired in more than 150 countries.